A protester was arrested for blocking the entrance to the Suffolk County House of Correction during a protest. 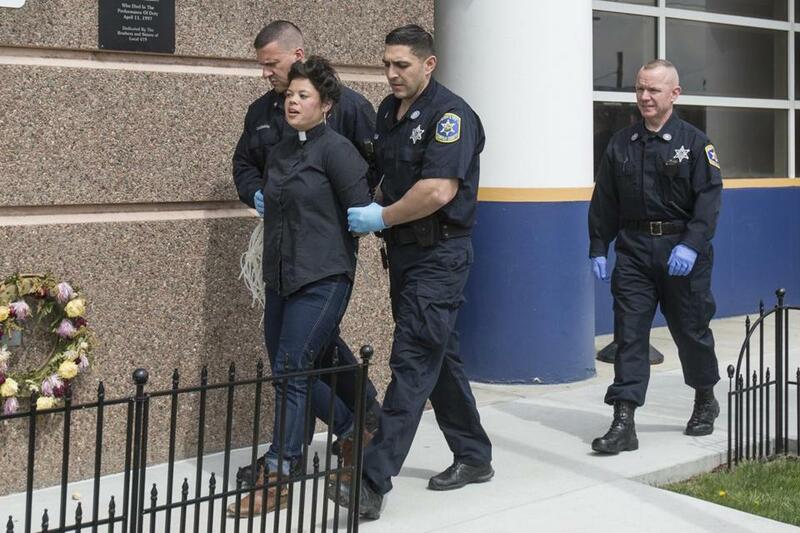 Twenty students, clergy, and other activists were arrested Monday afternoon after they sat down, linked arms, and blocked the entrance to the Suffolk County House of Correction to protest the detention and deportation of immigrants who are living illegally in the United States. The action was the first civil disobedience action on immigration issues in Boston in recent months and among the largest nationally since President Trump took office, according to Cosecha, the immigrant rights group that organized the march and sit-in. Monday night, the protesters remained in custody, though Cosecha representatives said they hoped the demonstrators would be released on bond within hours. The organization said no charges had been filed. Cheering on the protesters with chanting and singing were about 80 people who marched from Dudley Square in Roxbury to the detention center in Dorchester. A brass band organized by the Boston Area Brigade of Activist Musicians provided lively accompaniment. Cosecha organizers said they hoped to galvanize public support for a national immigrants’ strike on May 1, the second Day Without Immigrants strike since Trump took office and issued executive orders and policy changes designed to clamp down on illegal immigration. More broadly, they said, they wanted to sound a clarion call for permanent protection for all immigrants and an end to the detention system in which some immigrants in the United States illegally are detained while their immigration status is resolved or pending their deportation. Diana Salas, a Cosecha volunteer, said immigrants also lived in fear during the Obama administration. Immigration and Customs Enforcement reported in December that it deported more than 2.7 million people in the first seven years of the Obama administration. “The raids aren’t new,” she said. But she said the tone now is markedly different. A protester was arrested for blocking the Suffolk County House of Correction. The federal government leases space in one of the eight buildings on the Suffolk County House of Correction campus, said a spokesman, Peter Van Delft. On Monday, he said, 167 of the 962 inmates housed there were immigration detainees. Handmade signs appeared in the windows above the entrance of the building amid the clamor of the protests. It is not clear who was housed in that building, but one read: “My name is Freeza.” Another sign appeared to read “Jose Cancela” and listed what appeared to be an alien number. Immigrants across the country stayed away from work and school in mid-February for “A Day Without Immigrants.” Although many employers supported the action, some participants lost jobs as a result. Cosecha activists said they hoped Monday’s action would boost the confidence of immigrants considering whether to join the May 1 strike. 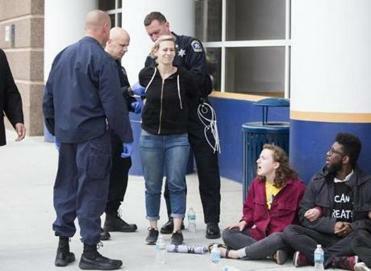 Several protesters said the recent arrests of three immigrant rights activists from Vermont — one of whom remains in custody — were of particular concern because they discouraged immigrants from advocating for themselves. Before she was arrested Monday, the Rev. Annie Gonzalez Milliken, who supports young adult and campus ministry for the Unitarian Universalist Association, said that as a US citizen, she felt it was her obligation to stand up for immigrants living here illegally. “The immigrant community is already taking on great risk to engage in these strikes,” she said. The two other clergy who were arrested were also Unitarian Universalists: the Rev. Elizabeth Nguyen, who promotes leadership development for youth and young adults of color for the denomination, which is headquartered in Boston; and the Rev. Heather Concannon of Unitarian Universalist Area Church at First Parish in Sherborn. A number of other clergy marched and cheered but did not participate in the civil disobedience. They included the Rev. Rainey Dankel of Trinity Church Boston; Rabbi Victor Reinstein of Nehar Shalom Community Synagogue; the Rev. Reebee Girash of Eliot Church of Newton, United Church of Christ; and the Rev. Laura Shatzer of Common Cathedral, an outdoor congregation of “housed and unhoused” people who worship on Boston Common. Rabbi Matt Soffer of Temple Israel of Boston, another protester, noted that the timing was poignant: Monday was Holocaust Remembrance Day, or Yom HaShoah. Another rabbi was also an immigrant: Rabbi Claudia Kreiman, of Temple Beth Zion in Brookline, is originally from Chile, and has also lived in Argentina and Israel. Having had a relatively easy time becoming a citizen last year, she said, she felt compelled to stand up for those who haven’t been so fortunate. Welcoming the stranger, she added, is also a religious obligation. Lisa Wangsness can be reached at lisa.wangness@globe.com.